There are many beautiful gardens in Tokyo and a lot of them are in or close to areas we recognize as shitamachi such as the Kiyosumi Garden, Koishikawa Korakuen Garden, Hamarikyu Gardens and the Mukojima-Hyakkaen Garden. 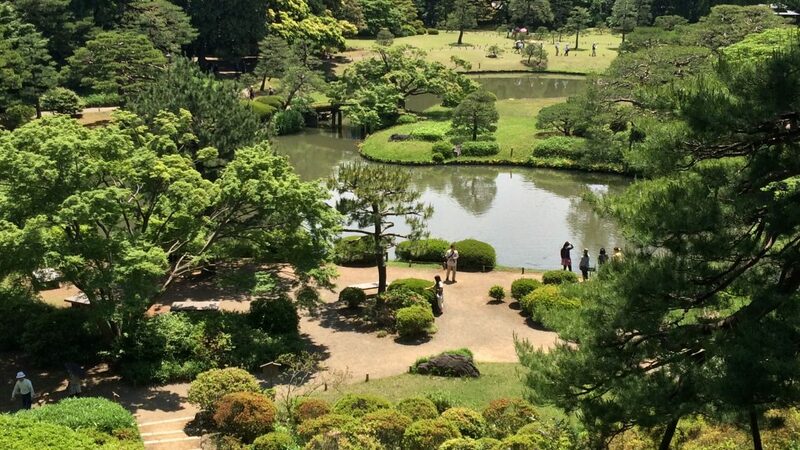 These gardens do not have the characteristics of shitamachi, but are rather associated with the rich and powerful who ruled Japan. Likely one of the most beautiful of all gardens in Tokyo is the Rikugien Garden, constructed during the late 17th century. The garden opened to the public in 1938 and was appointed as a “special beauty spot of Japan” in 1953. In most gardens in Tokyo, you are still very well aware of the city around you, with high rise buildings complementing the view you experience in the garden. In Rikugien, however, the Japanese garden is embedded into a larger park and the buildings around the park are not that high, which makes the garden breath and feel more natural. The garden was designed by Yanagisawa Yoshiyasu, an official in the Tokugawa shogunate and a favorite of Tokugawa Tsunayoshi (5th Tokugawa shogun, reign: 1680-1709), starting out as the male lover (wakashu) of the shogun. Yanagisawa received this piece of land (the former residence of Maeda Tsunanori) in 1695 from Tsunayoshi himself, and then started constructing the garden until it was ready in 1702. This garden is a typical kaiyu-shiki-teien style garden featuring a central pond or small lake with path going around it, that needs to be walked clockwise. The name, Rikugien, comes from the 6 elements of Waka poems that had been derived from the “six classifications of poetry” (shi no rikugi) written in the old Chinese poetry book Mao Shi. Waka poems are composed in Japanese, and are contrasted with poetry composed by Japanese poets in Classical Chinese. These 6 classifications are: airs, straightforward narrative, explicit comparisons, implied comparisons, odes, and hymns. In the garden, certain scenery is given names from these Chinese texts. In total, there are 88 scenic spots, named not only after incidents from Chinese history, but also evoking famous places in Japan and direct references to Waka poems, that can be enjoyed throughout the garden. Plaques with information are placed at each of these spots. The garden is quite large (87,809.41 square meters) and it will take an hour to get around. Be sure to take a rest and have some tea at the Fukiage Chaya teahouse (matcha and a sweet for JPY 510). There are special periods in spring and autumn when the garden is open until 21:00 with special lighting in order to enjoy respectively the blooming sakura trees or the colorful autumn foliage. The most popular spot in the garden. From the 35 meter high artificial elevation (called Tsukiyama) you have a beautiful view over the garden and pond (see the photo at the top of this article). The place on which this scene is modeled actually exists in Wakayama Prefecture. The Azalea flowers that can be seen from this point are particularly famous and bloom colorfully from the end of April until early May. This narrow path is named after a poem by Princess Sotoori, known as one of the three masters of Japanese poetry. It is about a wish for eternity, even if it is as thin as a spider’s web. It comes from the Nihon Shoki (720), translated as the Chronicles of Japan, which is the second oldest book of classical Japanese history. My beloved is to come tonight. The spider’s sure movement seems to foretell it. A beautiful view on the shore of the pond. On the left you see Horai island, on the right Naka island, and on the opposite shore you see Fukiagehama. It is named after an ancient Japanese poem by Jien from the early 13th century. A crane cries sadly as the moon rides and tide washes the shores of Wakanoura. Entrance fee: JPY 300. Seniors 65 and older: JPY 150. When to best visit? In spring during sakura season (usually late March) or during autumn (mid-November until early December) with the autumn colors it is most beautiful. At these times also the opening time is extended with a special “light-up”. Avoid the days with free entry (4 May, 1 October) as it can get very crowded. During peak season in spring and autumn, be prepared to move very slowly as everyone has to follow one specific route. Why visit? One of the most beautiful spots in Tokyo and one of the best examples of a Kaiyu-shiki-teien style garden in Japan.